ENG: Monsieur De Givenchy himself elected many of his favorite designs for this exhibition. Some of the presented dresses have never been displayed before. NL: Monsieur De Givenchy zelf heeft zijn meest geliefde creaties geselecteerd. Sommigen werden nog nooit eerder voor het publiek tentoongesteld. ENG: The exhibition gives also a tribute to the muse of the designer and style icon of all times – Audrey Hepburn. Part of the exhibition is specifically focused on the friendship and professional collaboration between the designer and the actress. Here you can find the iconic dresses of Audrey from renowned films, such as Breakfast at Tiffany’s, How to Steal a Million and Funny Face. This part of the exhibition was of my specific interest. I am not the first one for who Audrey Hepburn is a style icon. Like millions of other women I love her feminine, chic, yet simple style. So for me it was super exciting to see all these beautiful looks that I have admired on the TV screen for years in real life. NL: De tentoonstelling eert ook de muse van de ontwerper en stijlicoon van alle tijden – Audrey Hepburn. Een groot deel van de tentoonstelling is op deze bijzondere vriendschap en samenwerking gebaseerd. Hier zijn de creaties van De Givenchy die Hepburn droeg in haar meest bekende films, zoals Breakfast at Tiffany’s, How to Steal a Million en Funny Face. Dit deel van de tentoonstelling was van mijn specifiek belang. Ik ben niet de eerste voor wie Audrey Hepburn een stijlicoon is. Zoals miljoenen vrouwen houd ik van haar vrouwelijke, chique en simpele stijl. Het was heel spannend voor mij om al deze prachtige jurkjes die ik op TV had bewonderd in het echt te zien. ENG: Hubert de Givenchy was also known for designing clothes for the world’s famous first ladies. The exhibition showcases also some of those designs including the green dress and a jacket worn by Princess Grace of Monaco at the White House (May 1961), as well as a beige evening ensemble ( dress, coat) and a pink coat designed for Jackie Kennedy. NL: Hubert De Givenchy was ook bekend om het ontwerpen van kleding voor de wereld’s meest bekende first ladies. De tentoonstelling presenteert ook sommige van deze creaties, zoals de groene jurk en een jas gedragen door Princess Grace of Monaco tijdens haar bezoek aan het Witte Huis en de beige avondensemble ontworpen voor Jackie Kennedy. ENG: Last but not least, as in all classic fashion presentations, the culmination is all about the wedding dress. Here comes the bride! NL: Zoals in alle klassieke mode presentaties is het hoogtepunt de trouwjurk. Hier komt de bruid! ENG: Givenchy’s beautiful bridal collection includes also two gowns worn by Audrey Hepburn during her first and second marriage. 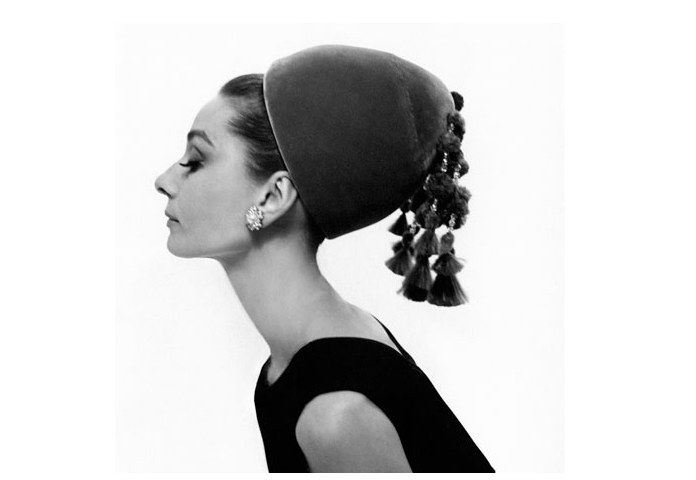 NL: De bruids-collectie van De Givenchy omvat ook twee trouwjurken gedragen door Audrey Hepburn tijdens haar eerste en tweede huwelijk. ENG: What I like about this exhibition (besides beautiful designs) is that it is guided by visual images including the fragments from favorite movies with Audrey Hepburn. It makes the whole experience more real, more alive. After the visit I was so inspired by Givenchy and Audrey Hepburn, that I re-watched Breakfast at Tiffany’s, but this time already with an “expert eye” capturing all the details of the dresses. In the end of the exhibition you can feel like one of Hepburn’s heroines by wearing the prototypes of accessories from Breakfast at Tiffany’s for a photo. The photo costs 1 euro and is being donated to UNICEF funds. NL: Naast prachtige creaties, vind ik het ook heel leuk dat de visuele beelden, zoals fragmenten uit mijn favoriete films met Audrey Hepburn als een deel van de tentoonstelling gebruikt zijn. Het maakt de beleving van de tentoonstelling meer echt en levend. Het was een heel inspirerend bezoek. Aann het eind van het bezoek kun je een foto maken a lá Audrey terwijl je de prototypes van accessoires uit Breakfast at Tiffany’s kan dragen. De foto kost 1 euro en alle inkomsten worden gedoneerd aan UNICEF. The exhibition is open until the 26th of March 2017 . The price for an adult is 14,50 euro. If you live in The Netherlands or happen to be here during this period, I will definitely recommend to visit it. You will get lots of positive emotions and energy from being surrounded by these beautiful Givenchy creations! This is it for this time. Don’t forget to let me know your opinion in a comment bar below.